Darling Rosie! She is such a doll! Rosie deserves nothing but the best in life. She is an absolute joy to be around. She is extremely smart and affectionate. 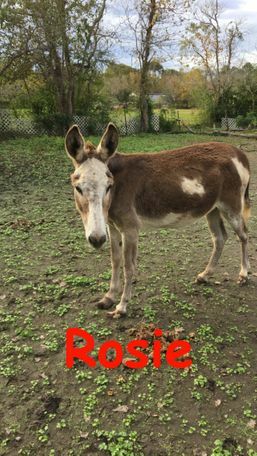 Rosie was very neglected when she arrived to us. She was very thin and had severe sunburns that blistered her face and ears. Her hooves were in such bad shape that our farrier has had to take the rehabilitation of them very slowly. Her hooves had somewhat deformed from neglect and overgrowth. Rosie is ready for her forever home. 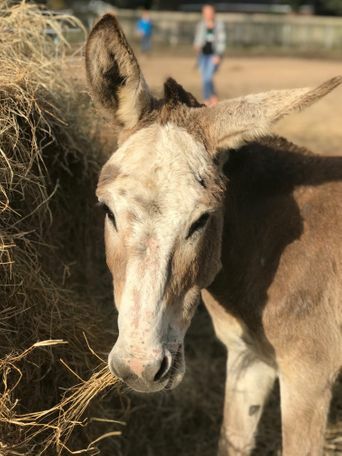 If her adopter would like, we will continue to send our farrier out to work on her hooves until she has completely recovered. We look forward to seeing Rosie in her forever home. We know she will bring great joy to any family!